Concrete Bonding Chemical And Bonding Agents use for Structural Repairs Moist cure to Beams, Columns, Slab Soffits and Chaja etc. We offer a vide range of Concrete and Mortar Admixtures which is made from the best grade material which is sourced from reliable vendors in the market. It reduces the requirement of water. These are highly used for construction of buildings, which is used as per the necessity for applying. It is a smooth paste of is easily used which is high in strength. Clients can purchase these products at reasonable prices. Features Perma Rapid Repair becomes hard and achieves high strengths within minutes of repair. Strength It is non shrink. Maximum Applicable Thickness repair edges of columns and beams damaged during deshuttering. We have Internal Plaster Crack Filling Product , Beam Crack Repair Product , Column Crack Repair Products, Structural Repair Products. Our exhaustive range of structural rehabilitation solutions is based on our understanding and knowledge that is attained by serving various industries like bridges, building structures, railways, ports and harbors. It contains an inbuilt integral waterproofing agent, corrosion resistant chemical, together with a chemically active ingredient which reacts with the hydrated cement paste to form insoluble crystalline pore fillers. To repair edges of columns and beams damaged during shuttering. To repair ceiling concrete damaged while shuttering. .
To repair edges at doors and windows. To repair general honey combs. Replaces costly phenolic resin system. We are among the leading manufacturers and exporter of a wide variety of Bonding Agent. These are manufactured using premium grade raw material as per the international quality standards. These adhesives are widely used to offer strong bonding, waterproofing, repair, and high adhesion. These bonding agents are highly accepted due to the features like long lasting effect. We export these at industry leading prices. Water proofing and tanking of basements. Bonding old concrete to new concrete. Apply passivated coat of SBR+ cement slurry. 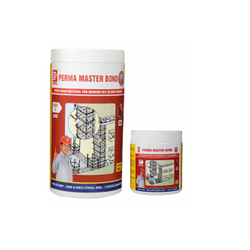 Apply Perma Bond SBR modified mortar by float or trowel to form an uniform smooth surface. Bonding slurry sets very fast hence modified mortar application should be fast and immediately after application of bonding slurry. Most cure for 24 hours and then allow it to dry off. This Mortar looks very dry. No further addition of SBR or water to be added. Remove the cover concrete and cut back to the sound concrete zone. Apply a passivated coat on the cleaned steel and leave it over night. When the bonding slurry is still tacky apply modified mortar by pressing in position using 10 litre SBR per 50kg bag of cement. Modified mortar can be applied up to a thickness of 20mm. For building up to higher thickness leave the first layer to dry over night and apply second layer with one more coat of bonding slurry. We Manufacture Latex Sbr Waterproofing Chemicals For The Construction Industry. Perma Latex SBR is based on Styrene Butadiene rubber, special adhesive and bonding chemicals along with hydrophilic agents. Perma Latex SBR gives a versatile performance in many civil engineering applications. The product is a milky white liquid. 1. An excellent product in concrete repairs as in combination with cement (1:1) it produces a very strong primer and as an additive in the mortar to make a strong waterproof plaster. 2. An indispensable product in floor repairs. Perma Latex SBR is used in mortar as an additive to make screeds which can be feather edged and can be used successfully in restoring the nosings of floor ducts and stairs. 3. In case of multilayered plaster Perma Latex SBR bonding slurry helps in building up layer after layer. The bond coat not only serves as a bonding agent but also as a waterproof barrier. 4. Perma Latex SBR modified mortars are used in joining prefabricated members and as bedding mortar in precast block work to secure water tight joints. 5. In terrace waterproofing and patch up repairs Perma Latex SBR forms an important member as it helps bonding new plaster to old plaster and also helps in making non shrink crack free mortar for repairs. 6. With fine sand cement mortar Perma Latex SBR is admixed to get an excellent adhesive for fixing wall panelling, stones, tiles including granite and marble tiles. 7. Cement Perma Latex SBR slurries are used as corrosion inhibitor on exposed reinforcements and on bridge girders to protect them from attack of chlorides and sulphates. 8. Perma Latex SBR is used in making waterproof slurries for repairs of old waterproofing works and waterproof mortars for new waterproofing works. 9. Perma Latex SBR is used in arresting leakages from water retaining structures whether through pipe, concrete junctions or from masonry pointings. 10. Perma Latex SBR is used in arresting leakages from overhead and underground potable water tanks. 1. Perma Latex SBR is a very strong bonding agent for mortars and concrete to bond with old concrete, stone, steel, brick etc. 2. Perma Latex SBR is a strong corrosion inhibitor. It prevents entry of chloride and sulphate ions into the cementitious structure. 3. Perma Latex SBR is a superior waterproofing product. 4. Perma Latex SBR is an excellent adhesive for tiles, stones, marble and granite tiles. 5. It is very easy to use and is non toxic. Perma Latex SBR poses no environmental hazards. 6. 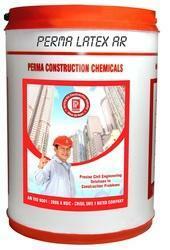 Perma Latex SBR increases the compressive, tensile and flexural strength of concrete and mortars. 7. Perma Latex SBR makes mortars non shrink, strong and dust proof. 8. Where no remedy exists for saltpetre action on walls, Perma Latex SBR modified mortar solves the problem with ease. 9. Perma Latex SBR is successfully used as a primer to brick bat coba systems on terraces. 10. Perma Latex SBR is economical than many similar products yet gives multifold advantages. Perma Crackfill replaces costly sealant and putties. It is non shrink, hence possibility of shrinkage cracks are non existant. It has high tensile strength and good adhesion property. The finish achieved is sufficiently smooth. Good resistance to freeze / thaw cycles, carbonation and attack by chlorides. Conventional curing is not required. Perma Crack fill is ideally suited for filling up of superficial plaster cracks as well as structural cracks. Perma Crack fill can be used for repairing ceiling cracks and plasters with ease because of its viscosity. Cracks arising due to plasters cracking at junctions of wall and column or brick work and soffit of beam can be effectively sealed. Cracks at parapet wall junction and roof slabs are also sealed with Perma Crackfill. Perma Crackfill replaces costly sealant and putties. It is non-shrink, hence possibility of shrinkage cracks are nonexistent. It has high tensile strength and good adhesion property. The finish achieved is sufficiently smooth. Good resistance to freeze / thaw cycles, carbonation and attack by chlorides. Conventional curing is not required. Perma Crackfill is available in two grades, namely grey and off white to suit the surrounding surface color and texture. The product is a blend of special cements, special additives and selected grades fine aggregates along with alkali resistant glass fibres. The product when mixed with water in the proportion of 3.5 Volume of powder to one volume of water results in a workable paste which can be trowelled to a fine finish. It is essential that the surface of the concrete to be repaired is sound, clean and uncontaminated. Chase the crack and form a neat “V” shaped groove at least 6mm wide on surface. Damaged plasters can be cut out in more or less square sides. Defective material must be removed carefully using reducing tools, needle guns or sharp tools and chipping hammers. Force must not be applied as it will damage the sound material beneath. Start curing after the material has sufficiently hardened for two days and then allow it to dry out slowly (i.e. protect from rapid drying due to wind, sun or excessive heat). Use of Curing Compound is ideal in repairs. Perma Crackfill is suitable for all subsequent decorative finishes and painting. The finish obtained by Perma Crackfill is far smoother than conventional plasters. Form : Free Flowing light grey/off white powder. We are one of the renowned manufacturer and supplier are engaged in providing a comprehensive variety of Bonding Agentto our national as well as international customers. These are easy and fast to the application that is safe and abrasion resistance. We offered to our clients for floor hardening which is widely used in industries and domestic applications. Our bonding agent is easily applied and dried quickly. These are available at cost effective prices as per the standard norms. Many application in repair works from Just one product. Easy to use - The product functions in all critical application methods. As bonding agent: Dilute Perma Bond with water in the proportion of 1:1 and brush apply on the concrete or plaster surface with the help of a brush.Within 10 minutes of this application apply a dash plaster with cement and coarse and to a minimum thickness. Wait for 24 hours and apply regular plaster. 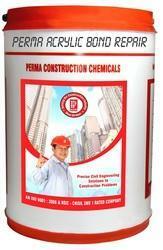 Perma Bond is environmentally safe and has not toxic effect on contact. 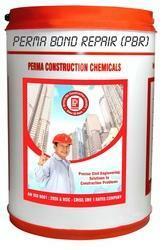 Perma Bond is supplied in 1 Liter, 5 Liters, 20 Liters and 100 Liters Packing. One year in manufacturers original packing. All PERMA branded products are manufactured under strict quality control supervision as per exact manufacturing specifications. Should you find the. Behavior of the product varying from the claims in the data sheets please stop the use of the product and contact the nearest Parma staff or distributor. Perma branded products when used in accordance with the current published directions for use, performs as per its data sheets / catalogue. The manufacturer and the distributor will not be responsible for other materials and conditions of inferior workmanship. We are the exporter and supplier broad array of Epoxy Concrete Bonding Agent. Our products are manufactured in accordance to various international standards to offer best to our clients. These epoxy bonding agents make the concrete very stronger and waterproof. Our products can be availed at most affordable rate. We can take bulk orders in supply of bonding agents. These ensure to provide a proper bond between old concrete and new overlays and enhance the workability of fresh concrete surface. Supplied in pre- weighed units. Perma Recreate is a cementatious Grey power with micro fine aggregates which allows re concreting of the damaged, dilapidated structures. The product is a boon for present day rehabilitation. The product needs only addition of water to form free flowing concrete with enormous initial and final strengths. Perma Recreate is a very handy tool in the hands of an advanced structural repair engineer to reconstruct parts of beams and columns with far superior strength, fair finished and with very high speed. Grouting structural cut outs and recess in sanitary fittings like floor traps,l annular spaces of pipe passes through walls etc., in residential buildings. Perma Recreate has very high workability hence it can be poured into the shutters with a mug also. This workability helps the product to reach all minor crevices and fill effectively. Perma Recreate develops a very strong bond with the parent concrete. It is impermeable and protects reinforcements form corrosion. It does not need elaborate curing just sprinkling water for two days is enough. Mix perma Recreate with water in the ratio of 5 litres to 5.5 litres of water to every 25 kg sack of material to get a uniform free flowing mortar. Pour this mortar in the rigidly fixed forms, Care should be taken to see that the contact surfaces are dampened before fixing the form. Shutter forms should be effectively sealed to avoid uncontrolled leakages. If the repaired surface needs re plastering then hack the surface immediately after removal of shutters. Surfaces to be re concreted with perma Recreate should be clean, sound, free form any laitence, or any deleterious material. Weak portions of the concrete should be cut back to sound surface. Reinforcements should be cleaned to remove rust and supplement additional reinforcements wherever required. Damp down the concrete surface before fixing the shutter forms. One 25 kg sack of perma Recreate produces a micro concrete which can fill 13.5 Liters of volume. In less demanding situation perma Recreate can be added with 10 mm down clean and sound aggregates. With the help of our experts we are manufacturing and exporting a qualitative range Acrylic Repair Bond. Our product range is largely used in different sectors for repairing slabs, beams and floors. These are manufactured using high quality chemicals at our sophisticated manufacturing unit. These are highly acknowledged due to their accurate composition and effectiveness. These bond agent materials are sourced from our trustworthy vendors and are available at competitive prices. 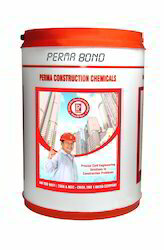 Perma Acrylic Bond Repair (PABR) is an aqueous emulsion of acrylic co polymer latex, Formulates for use with cement (PABR) modifies the property of cement in mortars and concrete to make them perform better. Useful for repairing of RCC beams, columns, Slabs & other RCC members. Our valued clients can avail a Concrete Repair Material which is exported and supplied in different quantity packaging. It is applicable for repairing beams and slabs. This is also used as fitting floor traps and pipe passes through walls for interior. We manufacture them with the standard quality material that is smooth and high strength in nature. They are offered to our valuable clients at competitive prices as per standard norms. 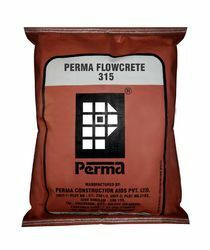 Perma Flowcreate is a cementitious grey powder with micro fine aggregates which allows re concreting of the damaged, dilapidated structures The product needs only addition of water to form a free flowing concrete with enormous initial and final strengths. Perma Flowcreate is useful to reconstruct parts of beams and columns with far superior strength and with very high speed. Grouting structural cut outs and recess in sanitary fitting like floor traps, annular spaces of pipe passes through walls etc., in residential buildings. Surface to be re-concerted with Perma Flowcreate should be clean, sound, free from any latience, or any delirious material. Weak portions of the concrete should be cut back to sound surface. Reinforcements should be cleaned to remove rust and supplement additional reinforcements wherever required. Damp down the concrete surface before fixing the shutter forms. We manufacture, supply and export our wide range of Adhesive And Cement Modifier. These are fabricated by using finest quality liquid. These are available at market leading prices. These are tested on several parameters by our quality inspectors. This gives a versatile performance in many civil engineering applications. This product is available in milky white liquid. This highly adhesive also has an excellent waterproofing ability. Perma Latex SBR is based on Styrene Butadiene rubber, and special adhesive and bonding chemicals along with hydrofluoric agents. Perma Latex SBR gives a versatile performance in many civil engineering applications. The product is a milky white liquid. In concrete repairs as in combination with cement (1:1) it produces a very strong primer and as an additive in the mortar to make strong water proof plaster. In floor repairs, Perma Latex SBR used in mortar as an additive to make screeds which can be feather edged and can be used successfully in restoring the no zings of floor ducts and stairs. In case of multi layered plaster Perma Latex SBR bonding slurry helps in building up layer after layer. The bond coat not only serves as a bonding agent but also as a water proof barrier. Perma Latex SBR modified mortars are used in joining prefabricated members and as bedding mortar in precast block work to secure watertight joints. In terrace waterproofing and patch up repairs Perma Latex SBR forms an important member as it helps in binding new plaster to old plaster and also helps in making non shrink crack free Mortar for repairs. With fine sand cement mortar Perma Latex SBR is admixed to get an excellent adhesive for fixing wall paneling, stones and tiles including granite and marble tiles. Perma Latex SBR cement slurry are used as corrosion inhibitor on exposed reinforcements and on bridge girders to protect them from attack of chlorides and sulphates. Perma Latex SBR is used in making water proof slurry for repair of old water proofing works and water proof mortars for new water proofing works. Curing of the modified mortar is essential to prevent it from premature drying out. After twenty four hours of application of the mortar start curing or by very light spray for two to three days and then allow it to dry off. Depends upon the type of use. Perma Latex is available in 100 ml, 250 ml, 500m1, 1litre, 5litre, 10litre, 25litre and 100litres packing. 12 months from the date of manufacture if stored in a cool, dry place in original packing. Perma Rapid Repair is composed of special polymers, a blend of portland cements and selected filler. Perma Rapid Repair is a free flowing fine powder designed with special polymers to achieve a quick repair system for concrete structures. The product achieves very high strength within minutes. To repair edges of columns and beams damaged during deshuttering. To repair ceiling concrete damaged while deshuttering. Perma Rapid Repair becomes hard and achieves high strengths within minutes of repair. Mix small quantity of Perma Rapid Repair powder with water. Quantity should be just enough for consumption within minutes or else it will set in the pan itself. Select water quantity such that the mix is just workable, neither too stiff nor a slurry. Using a spatula or a small trowel apply the dough of Perma Rapid Repair and shape it from the edge immediately. After the material has sufficiently hardened i.e. after two or three hours, moisture cure the repaired area. Areas repaired with Perma Rapid Repair are suitable for subsequent decorative finishes and can be painted over. Perma Rapid Repair is not toxic and safe to handle. Use dust masks and hand gloves while using the product. Perma Rapid Repair is available in 10 kg and 25 kg packing. Perma Rapid Repair has a shelf life of 12 Months from the date of manufacture if stored in original packing. Our esteemed clients can avail an exclusive range of Polymer Base Cement Mortars at cost effective prices. It is applicable for plastering the crack on the walls and ceilings. This cement is also used as plastering while painting the walls. We manufacture them with the standard quality material that is smooth and high strength in nature. This can be easily applied and dried fast. It is a fine gray powder which is mixed with water to make a smooth paste. Perma Render Coat is a specially formulates mortar with Portland cement graded fillers and polymers to meet the requirement of waterproof crack-free thin render, for application to walls and Ceiling. It is best suites for filling up the undulations in the normal plasters. The product can be used for rendering brick works and block works. It could also used as a general purpose non-shrink crack filling and patch work repairing compound. Ensure that the surface to be rendered is clean and free from dust, dirt, grease etc. Mix render coat with clean water, in the proportion of 3.5 to 4 volumes of powder to i volume of water. Mix till a uniform consistency smooth paste is obtains. Leave the paste for ten minutes in the pan for the entrapped air if any to escape and remix the paste. Apply the paste uniformly on to the surface to be rendered. With a putty blade or spatula level the surface to a smooth finish. The product can be applied in thickness varying between 1mm to 10 mm. In crack filling 1 kg cover an area of 100 linear ft. For groove size 12 mm and 6 mm. We have gained vast expertise in offering a superior range of Polymer Mortar to our clients. The polymeric admixtures include latexes or emulsions, re dispersible polymer powders, water-soluble polymers, liquid resins and monomers. It has low permeability, and it reduces the incidence of drying shrinkage cracking, mainly designed for repairing concrete structures. These are available at market price. Perma polycrete is supplied in 25 kgs sack. 12 months when stored as recommended in original packing in coll and dry conditions. We are the suppliers of a wide range of Repair Mortar and Bonding Agent. These mortars apply for restoration and rehabilitation of structures, repairing and patching works of reinforced cement concrete and reinforcing cement concrete and steel constructions. Clients can avail this repair mortar and bonding agent at a reasonable price in the market. It is widely used in the construction industry. These repair mortars are easy to apply. Are the suppliers of a wide range of Repair Mortar and Bonding Agent. These mortars apply for restoration and rehabilitation of structures, repairing and patching works of reinforced cement concrete and reinforcing cement concrete and steel constructions. Clients can avail this repair mortar and bonding agent ata reasonable price in the market. It is widely used in the construction industry. These repair mortars are easy to apply. 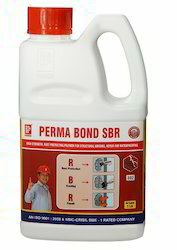 Perma Bond Repair is an aqueous emulsion of Styrene Butadiene Copolymer latex, specially formulated for use with cement. PBR modifies the property of cement in mortars and in concrete to make them perform better. In terms of water proofing, repair, corrosion inhibition, bonding, durability and wear resistance. On a cleaned and prepared concrete and steel surface after the passivator coat has dried apply Perma Bond Repair Bonding Slurry. Apply Perma Bond Repair modified mortar by locator trowel. Bonding slurry sets very fast hence modified mortar application should be fast and immediate after application of bonding slurry. Applies Banding Slurry sets very fast. 1 litre Perma Bond Repair with 1 kg of cement gives a slurry which covers 20 to 25 sqft. We are one of the most reputed exporter and supplier of Concrete Repair Product. These concrete materials are very strength in application for underwater constructions and repairs. It consists of chemical resistance properties and high quality materials in fabrication. We also offer these as per the customized requirements of clients. These are offered to our valuable clients at affordable rates as per standard norms. Our concrete material is easy to apply and makes the repairs more effectively and strong. Perma Recrete UW is a cementilitious gray powder with micro fine aggregates and glass fiber reinforcements. This product needs only addition of requisite quantity of water to form a thick sotropic paste. Perma Recreate UW is used for repairing submerged structures such as bridge piers, quay walls and general and marine structures. The product is thick sotropic and has anti washout properties hence easy to work with in underwater repairs and construction. This property helps the divers with clear visibility of the workmanship and the work can be carries out precisely. The product developers high early and ultimate strengths which is very important in under water construction and repair works. 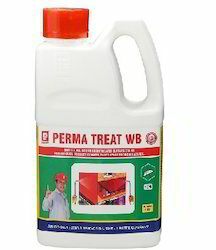 Perma Recrete UW is non shrink and hence does not develop and cracks. This keeps the repairs area strong. 13.5 Litres per 25 kgs Sack. We offer a gamut range of Cement Bonding Additive which is made from the best grade material which is sourced from reliable vendors in the market. These are highly used for floor repairs, waterproof plaster and bonding old concrete to new, which is applied as per the necessity for applying. It is a smooth paste of a mixture of cement, sand, water and perms latex AR, this paste is easily applied which is high in strength. Clients can purchase these products at reasonable prices. Appreciation method of Perma Latex AR consist of applying a primer and when the primer is still tacky apply the mortar. Primer is made by mixing Perma Latex AR, Water and cement in various proportions. The mortar consists of cement, sand, water and Perma Latex AR in various proportions depending upon the type and area of use. We offer a superior range of this Concrete Bonding Agent it is a fabulous bonding agent which is a smooth paste for plastering on concrete surface. Our product is highly appreciated for high strength and perfect in application. These bonding agents are manufactured by usage of fine grade materials that suits in all applications. This can be easily applied and dried fast. Clients can purchase these products at affordable prices. 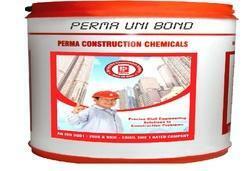 Perma Unibond is a product based on water dispersible complex polymers and graded aggregates. Application of this product on plaster or concrete surface allows for minimal surface preparation there by saving on cost and labor. Looking for Concrete Bonding Chemical and Bonding Agents ?